Mahler was best known during his own lifetime as one of the leading orchestral and operatic conductors of the day, but he has since come to be acknowledged as among the most important post-romantic composers – a remarkable feat for a figure whose mature creativity was concentrated in just two genres: song and symphony. Besides the nine completed symphonies, his principal works are the song cycles Lieder eines fahrenden Gesellen (usually rendered as ‘Songs of a Wayfarer’, but literally ‘Songs of a Travelling Journeyman’) and Kindertotenlieder (‘Songs on the Death of Children’), and the synthesis of symphony and song cycle that is Das Lied von der Erde (‘The Song of the Earth’). 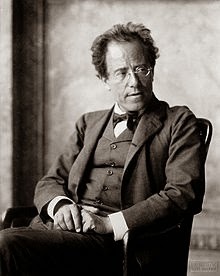 Mahler told fellow composer Jean Sibelius in 1907 that “a symphony should be like the world: it must embrace everything”; putting this philosophy into practice, he brought the genre to a new level of artistic development. After Beethoven, fifth symphonies became special landmarks for composers working in the Austro-German symphonic tradition. Mahler’s is an epic work: large in scale, extreme in its expressive character, abundant in its musical ideas and invention. Its five movements create a broad sonic arch, capped by an elaborate Scherzo. Flanking this, to start the symphony, are a funeral march followed by music of violent intensity; and following the Scherzo, a dream-like Adagietto and an ebullient, contrapuntally embellished finale. In the Adagietto, scored only for strings and harp, we return to a romantic dream world familiar from Mahler’s earlier works—a world of quiet contemplation, benign simplicity, inner peace, and escape from harsh reality. The fourth movement is arguably Mahler's most famous single piece of music, and is the most frequently performed extract from Mahler's works. It is perhaps best known for its use in the 1971 Luchino Visconti film Death in Venice. However it was frequently performed on its own before then, chiefly because in the early 20th century music programmers did not believe whole Mahler symphonies would be acceptable to audiences. Indeed, the British premiere of the entire Fifth Symphony came thirty-six years after the Adagietto alone had been introduced, by conductor Henry Wood at a Proms concert in 1909. It lasts for approximately 10 minutes, and Mahler adds the instruction sehr langsam (very slowly). This has led to some conductors taking the movement well over its normal duration, in some cases nearly 12 minutes (viz. recordings by Eliahu Inbal, Herbert von Karajan, and Claudio Abbado). However, in recent years the trend appears to have moved away from such extreme tempi, notably in the swiftly-paced (9-1/2 minute) inaugural recording from Simon Rattle as chief conductor of the Berlin Philharmonic Orchestra. The celebrated Adagietto, a 'song without words' played on the strings and discreetly accompanied by the harp. The central episode develops and amplifies the initial theme, passing through a wide range of different keys before being restated in a much modified form. The mood is one of gentle meditation, as in the Lied Ich bin der Welt abhanden gekommen which is so close in thematic content. Anyone thinking about Mahler's Fifth Symphony automatically thinks of the Adagietto - since 1971 in any case, ever since the movement was used as the soundtrack to Luchino Visconti's film Death in Venice, significantly contributing to the melancholy charm of the adaptation of Thomas Mann's novella. Visconti, however, reinterprets the music, turning the Adagietto into a cipher for a farewell to life. Mahler, on the other hand, wrote this music when he had just fallen in love with Alma Schindler, who was later to become his wife. And indeed, what the unbiased listener can hear in particular in the Adagietto is tenderness, dreaming, and a sense of yearning, full of hope. Yet Mahler would not be Mahler if he were to colour a whole symphony with one unified romantic mood. So he starts the work with a funeral march, and in the following two movements he disseminates a vehemence that is partly cataclysmic, partly dance-like. The finale culminates in buoyant mood, which may have been unusual for Mahler, yet as he composed this movement while on honeymoon with Alma in the summer of 1902, it is perhaps no surprise.